Russian Video: Scarlet Sails – 2009! 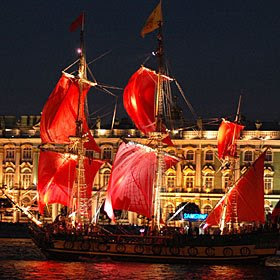 Every year the night 20-21st of June is one of the most beautiful celebrations in St. Petersburg – “Алые Паруса” (Scarlet Sails). Pupils who just finished school are celebrating the end of school and the start of new life. Every year we are looking for the most beautiful videos of this performance and share them with our readers. If you like the videos maybe you want to find out more about this festival and watch Scarlet Sails – 2008! This entry was posted in Musical Video, Place to visit, St.Peterbug, Theater on June 21, 2009 by admin.